EASTPOINTE, MI - The car cruising community is a lot like Cheers. Go to an event, and it becomes a place where everybody knows your name. All this week, including cruise day, Cruisin' Gratiot has a car show. I attended one Wednesday and had the pleasure to meet three cruisers and their classic rides. Gary Geldhof, a Chrysler retiree, echoed a theme I heard many times at the car show: everyone in the car cruising community knows one another & everyone is friendly. Every time a new person walked up to the show, they were welcomed and made to feel at home. 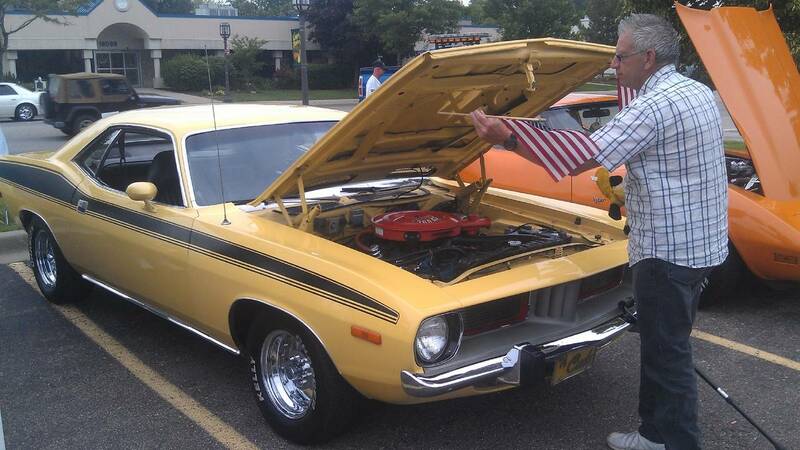 Gary owns a canary yellow 1974 Plymouth Cuda nicknamed the "Banana". Once an undercover cop car, he's proud to say all the parts are original. Bought by his uncle in 1976 for $1,400, Gary purchased it from him in 2001 and didn't display it until 2008. I'm 6 foot 8. I never fit comfortably into a car. But I sat down and had more leg room than I've ever had in my life. Gary tells me that's because they don't make them like the Cuda anymore. This is a family car and so are a lot of the rides you'll see at car shows and cruises throughout the summer. Gary and other cruisers say they'll pass these rides down to younger family members. There are a lot of memories made and cruisers say knowing the history of their ride is important to them. Pete Spaunburg is a disabled naval vet whose military service during the Vietnam-era took him all over the world. He owns a 1957 Chevy 210 sedan and found it with a lot of the parts, including the transmission, thrown inside the ride. Built from the ground up over the span of 8 years, it has one of the more unique features under the hood you'll ever see: the overflow tank is a Jack Daniels bottle. Pete's wife, Cindy, set up her ride right next to her husbands. Her and her 1980 Chevy Camaro have been to all but one Cruisin' Gratiot car cruise. She's does all her own repairs and has built much of the vehicle. She tells me she used to sell doors & she swears she sold more because she would drive up to businesses with her Camaro. If you get a chance, make sure to head out to one of the Cruisin' Gratiot car shows and head out to the cruise Saturday. There's plenty to do the rest of the week and you'll find more details here and at http://www.cruisin-gratiot.com. Have some classic cars pictures you want to show off? Use the hashtag #CruiseTheD & follow us on Twitter and Instagram @CruiseTheD for all your latest car cruising and classic car news. Your pictures will show up in our Cruise The D app for everyone to see. To check out all the pictures from this Cruisin' Gratiot car show, including that Jack Daniels overflow tank, check out the Quick Clicks section above. We know you're going to be taking pictures of all the sweet rides as you go Cruisin' across Michigan this summer - so why not share them with the world? Use the hashtag #CruiseTheD on Twitter or Instagram and follow @CruiseTheD on Twitter for all your latest classic car & cruisin' news.